"I'm the mother of a son with some significant disabilities, and your inventions have had a direct role in his ability to have a higher quality of life." Across a half-day discussion of invention, patent law and the innovation economy, it was that comment from veteran journalist Judy Woodruff that got to the heart of the current patent policy debate and the stakes it holds for inventors and the people whose lives they improve. Woodruff was moderating a discussion with inventors Dean Kamen and Qualcomm co-founder Irwin Jacobs, who -- along with judges, trade and regulatory officials, historians and venture capitalists – convened at the Newseum in Washington on Friday to discuss the role patents play in nurturing invention and economic growth. If you missed the event and have an interest in patent policy, you can view it here. For the intellectual property world, it was must-see TV. Woodruff, co-anchor and managing editor of the PBS NewsHour, made the rare personal reflection as she introduced Kamen, whose inventing career took off three decades ago when as a teenager he created a medicinal pump for neonatal babies suffering from cancer. The host of inventions he would later create includes the first home dialysis system, an all-terrain wheelchair that goes up stairs, and a robotic arm for soldiers who lost their limbs on the battlefield. 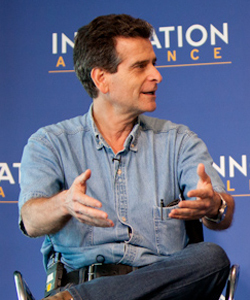 But Kamen said his ability to continue inventing could be threatened by the potential weakening of patent protections in several bills working their way through the House and Senate. For under the terminology coloring the production of the half dozen patent proposals, Kamen is a "troll," since he invents but doesn't manufacture, instead licensing his technology to much bigger companies that produce and distribute the resulting product. After taking seven years to build up his first company with a sales force, distribution channels, manufacturing facilities and infrastructure, Kamen decided that running a business was taking too much time, effort and overhead expense that got passed on to patients. So he sold it, and began a series of partnerships with larger companies. "It took me years to become a troll," Kamen said. "The lesson I learned from that was: Hey Dean, you like doing inventing, you like solving problems in new ways, you like creating stuff, get good at that, because while it's the highest risk part of it and you'll fail a lot, you only have to get it right once in a while. Then you can go to these big guys and say to them, you take it out to the world," Kamen recounted. "I just saw back then: Wow, what a neat symbiotic relationship I could have if I could create stuff and focus just on that front end, which we can get better and better at, with really developing rapid prototyping and bringing on a group of really young and passionate engineers who don't mind failing and can focus all day on some new idea. Because those big companies have to focus every day on making a million more of this high quality device." What this relationship means is that the whole value of Kamen's company and work now depends on patents and the exclusive rights to his inventions they guarantee. That's all he's got when sitting across the negotiating table from his much bigger partners. Which is why the current patent legislation has him worried. The net effects of the proposed changes to patent law currently circulating on Capitol Hill would be to make it harder and more expensive for patent holders to enforce their intellectual property rights in court, Kamen and other conference participants said. And that, he said, would create a risky uncertainty about the patents for his inventions, making it difficult to build partnership with manufacturers and distributors – and make it even harder for start-up inventors to get financing to back their ideas. "The only reason we have an organized society is that we trust certain things that are abstract [like] intellectual property," Kamen said. Patents are to inventors what a deed to land is for a builder or a homeowner. Kamen asked the audience to imagine what it would be like to go to a bank with a deed to get a loan for building an office building or a house when the bank knows that however valid the deed is, someone else could construct something on the land and going to court to remove them would be hard. "Since so few people on a daily basis deal with patents, they dramatically underestimate how problematic it is for an inventor who worked hard, who got that patent to be now told, ‘maybe …'" Kamen said. "If you undermine the value of patents, you make it hard for innovation to be funded." Jacobs, who co-founded a company that now employs more than 27,000 people, said that without a reliable patent system, most big inventing companies would never have gotten off the ground in the first place and been able to keep innovating. "In the case of Qualcomm," Jacobs said, "we were able to raise the money based on having that intellectual property, and then be able to develop more and more and more and improve cellular communications tremendously over the years. But without that protection we would have been in bad shape." "Practicing or Non-Practicing Doesn't Mean Anything"
The other panels at the conference drove home similar messages. 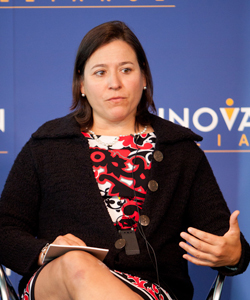 Valerie Gaydos, the founder of Angel Venture Forum, said that when she's judging whether to fund a start-up, patents are the most important collateral. "Without that, an idea is just a napkin" it's written on, she said. 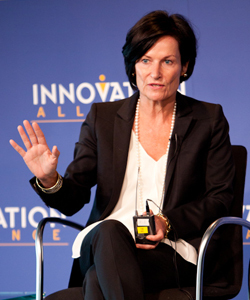 Lita Nelson, director of technology licensing at the Massachusetts Institute of Technology, said professors and researchers could never get funding to take risks trying to solve "problems that haven't been solved" or "diseases that have never been cured" without patents guaranteeing the opportunity to earn market-based rewards for their discoveries. "Turning ideas at that stage into products for the public is a very big risk." Wesley Blakeslee, executive director of the Johns Hopkins Technology Transfer Office, added that no one could afford to take huge risks, spending hundreds of millions of dollars to create new products or drugs without the ability to recoup investment that comes only from patents. And Blakeslee, who said he has had to fight off bad-faith patent lawsuits on behalf of universities, expressed frustration with a patent policy debate focused on companies labeled as trolls just because they don't manufacture, or practice, their patented technologies. "The idea that you're practicing or non-practicing doesn't mean anything," he said. "It's the liars and the charlatans [using patents dishonestly] that are the issue." Laurie Self, a vice president and counsel for Qualcomm, said there are indeed companies that abuse the system, and that Qualcomm has been the target of infringement suits for patents that were either invalid or not infringed. "But we fundamentally do not believe that you achieve litigation reform by devaluing property rights," she said. 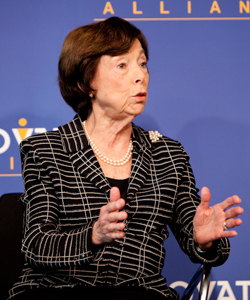 Former U.S. Trade Representative Carla Hills agreed. "The judiciary knows when there's misbehavior in a patent case, just as they know when there's misbehavior in a contract enforcement case," Hills said, adding that the patent system is enormously important to both the U.S. and global economies. "Yes, there are misbehaviors that the judge needs to rap down. But let's not kill the golden goose that laid our golden egg." The former chief judge of the Federal Circuit, Paul Michel, told the conference that judges already have the tools to deal with frivolous litigation and that district courts are already adopting new rules to fix the problems Congress wants to address. "Once you intrude on the inherent authority of the courts to actually conduct the individual cases of litigation before them … you are breaking down those divisions between the branches of government. And there is a grave danger in doing that," O'Malley said.breaching the constitutional separation of powers by focusing on litigation case management. If it's done in the IP arena, Congress could just as easily change procedures for civil rights cases or contract cases, she said. "Once you start down that road, [you] break down those barriers between the branches of government and you weaken the judiciary that has to be there and has to be strong for purposes of making sure that there are not encroachments on freedoms and liberties and everything else that is guaranteed in the Constitution that come from the other branches of government," O'Malley said. "I'm not here to say that courts are perfect," she added, "But the reality is that courts are doing a lot, and no one is giving them any credit for it." Several participants in the conference suggested the biggest hurdle to enacting any legislative response to litigation problems is that no credible studies have quantified the phenomenon of bad patent litigation. As the conference was under way, the Federal Trade Commission announced a new study of so-called patent-assertion entities, and FTC Commissioner Maureen Ohlhausen told the conference the goal would be to better understand how companies assert patents. "We don't have enough data to know whether this is a competition problem," she said. In the meantime, Ohlhausen, Hills and Deanna Tanner Okun, former chair of the International Trade Commission, warned that the world was watching the U.S. patent debate and that many countries are looking for an excuse to trample American intellectual property rights. "The world looks at the United States in a number of ways. Rule of law is one," said Hills, who negotiated the North American Free Trade Agreement and its protections for intellectual property. "Countries that are emerging economies do not have established institutions. And when you talk to the academics and elites in those countries, they understand that to have fairness and justice, to keep tranquility in the country, it is essential to have institutions that the public relies upon and respects," she said. "We know that globalization and the movement toward a more technologically great world is only going to increase. And we want that to happen. "I know people who spent six years in a garage developing an idea, and really suffering while they were so keen about it," Hills said. "And not to have protection of the idea as it came to fruition is an enormous loss."